UMass Amherst fraternity members will bake challah at the college’s Chabad Jewish Student Center this Wednesday, distributing the braided bread to local seniors in assisted living centers while promoting Jewish pride on a campus marred by anti-Semitism. In recent weeks, carvings of swastikas appeared around campus and, on March 25, hackers sent hate-filled anti-Semitic flyers to the university’s printers and fax machines. Several schools around the country were targeted. Student center director Yocheved Rivkah Adelman said she hopes the upcoming mass baking session, part of the “Helping Hands” program, will help the Amherst community heal, bridging the gap between students of all religious backgrounds as well as between older and younger generations. Adelman created the program in 2011 as a way to further student interactions with the Amherst senior community. Student interest in Helping Hands events has been significant, said Adelman, who noted that Greek organizations have ranked among the many campus groups on the list to participate. Members of Alpha Phi Omega, a co-ed fraternity, are slated to take part in this Wednesday’s workshop. 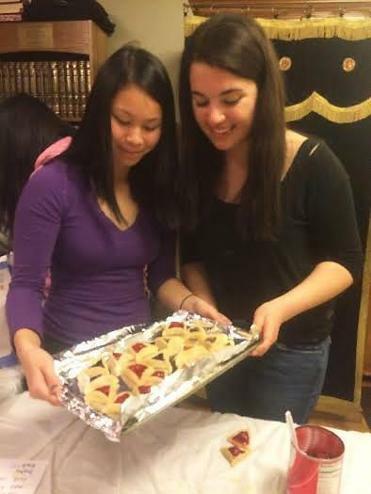 Late last month, Helping Hands gathered students to bake cookies for the Jewish holiday of Purim known as hamantaschen and distribute them to local nursing homes.